Probably my favorite of all the creamy soups I make. I like my soups very thick so I use cream in all my soups for a rich and creamy texture. Sometimes I make it plain without the ham and sprinkle bacon on top but today I wanted to use some leftover Christmas ham. If you like thick and creamy potato soup, you will love this recipe. Cook potatoes in generously salted water until tender. Drain well and set aside. In separate saucepan, melt butter over medium-low heat. and saute celery, onion, salt and pepper. Whisk in flour stirring constantly for 1-2 minutes until vegetables are tender and flour has cooked lightly. Slowly whisk in half and half or milk. Continue whisking until mixture begins to thicken. Add in cream and continue stirring until soup is very creamy. Add in ham and potatoes and stir until blended. Salt and pepper to taste. Serve in mug or bowl and add shredded cheese on top. 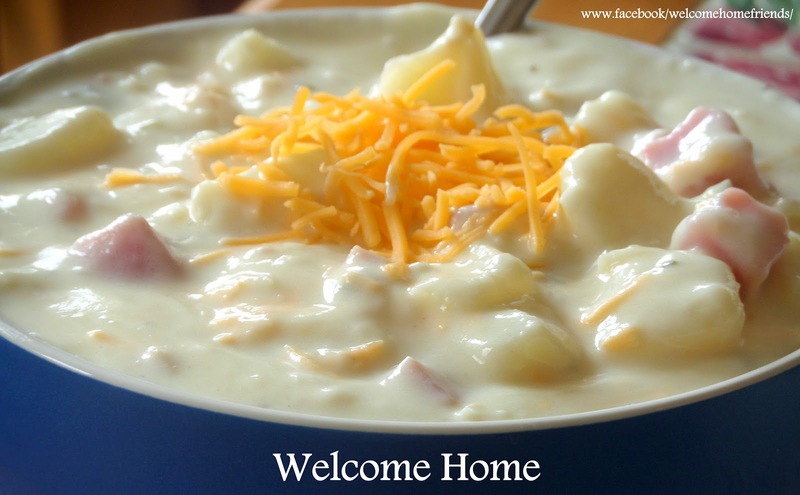 Love thick, creamy and easy potato soup. This one's for me! Thanks for sharing. This looks like something that we would really enjoy.........just signed up for your blog. Perfect for Easter leftovers. Even added in the leftover corn casserole and a shredded carrot. Awesome soup!! I have made this soup several times and each time my family raves and raves. Thank you for sharing Marty. This sounds so delicious!! Scrumptious looking pictures!! Pinning it!! Marty, is there anyway to post your recipes so that it is easily copied? Love your recipes, so does my family! Nanceene Ainsworth, a Print Friendly button has been provided under each recipe for you to print recipes. No need to copy. Love potatoes and Ham!!!!!!!! Been looking for a great potato soup and I think I have found it. Thank you for the recipe.